Joe Biden’s antics against Paul Ryan have taken a few days to sink in, and should take longer still. For starters, try to imagine being Paul Ryan last Thursday [Oct. 11th]: a young politician in the hot seat, the eyes of the world pressing upon him, as he tries to make succinct statements in a most-intense environment, while all along, literally nearly every minute—Biden interrupted Ryan 80-plus times—his opponent smirks, scoffs, laughs uncontrollably, flaps his arms, and, generally, behaves extremely rudely. I ask readers: Could you have endured what Paul Ryan handled? 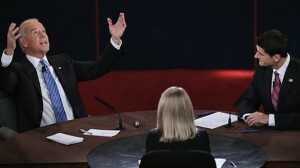 Given what he was up against, Paul Ryan’s debate performance was truly remarkable. It was extraordinary. As for Joe Biden, his disrespectfulness was of historic proportions. Only the blindest partisan Democrats, or really angry liberals, liked what Biden did. “I don’t believe I’ve ever seen a debate where one candidate was as openly disrespectful … and openly contemptuous,” observed a stunned Chris Wallace, a veteran reporter who has watched every presidential and vice-presidential debate since Kennedy v. Nixon in 1960. In July 1959, a young Richard Nixon, vice president of the United States, was an unfortunate victim of an impromptu debate with an old, bald, bombastic Nikita Khrushchev. The two went at it vigorously, with Khrushchev pleasing (at best) only the hardest communist apparatchiks, and with Nixon, many years younger, trying to make thoughtful statements while getting continually shouted at—but ably holding his own. If Paul Ryan rises to the level Richard Nixon did, we’ll think of his debate with Biden as we do Nixon’s showdown with Khrushchev—a defining marker in his career. At the same time, Ryan will not crash and burn like Nixon, because Ryan is more of a people person and has greater integrity. Despite the left’s never-ending attempts to demonize Paul Ryan, Americans will like him—which brings me to my other analogy, Ronald Reagan. In October 1947, a young and green Ronald Reagan appeared before the House Committee on Un-American Activities. He was president of the Screen Actors Guild. His youth was not lost on Newsweek, which said that Reagan looked so boyish that when he stood to speak the room was filled with “oh’s and ah’s,” especially from the contingent of star-struck girls who came to ogle him. By all accounts, from left to right, Reagan’s testimony was mature. He was first questioned by Robert Stripling, the House Committee’s tough chief investigator, and then by Chairman J. Parnell Thomas. Reagan did remarkably well under the lights, cameras, and intense pressure. In fact, Chairman Thomas immediately followed Reagan’s closing by conceding: “We agree with that. Thank you very much.” At the other end of the spectrum, among liberals, James Loeb, executive secretary of Americans for Democratic Action (ADA), dubbed Reagan’s testimony “by all odds, the most honest and forthright,” saying he was “really magnificent.” Loeb called Reagan “the hero” of the Washington hearings. This, too, was a decisive marker in Reagan’s ultimate political rise. We watch the footage in every documentary on Reagan—as we will Paul Ryan’s trial with Joe Biden. If Barack Obama ultimately loses the presidency, this will have been Joe Biden’s swan song, but not before leaving us with one for the history books. It will be remembered not just in Biden lore but in the life and path of Paul Ryan. And, in the end, Ryan’s performance will be remembered much more fondly. Previous ArticleIs God a Cardinals Fan?